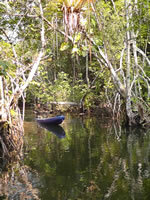 Kayak is often the easiest mode of transport through the reserve which is full of mangroves and lagoons. 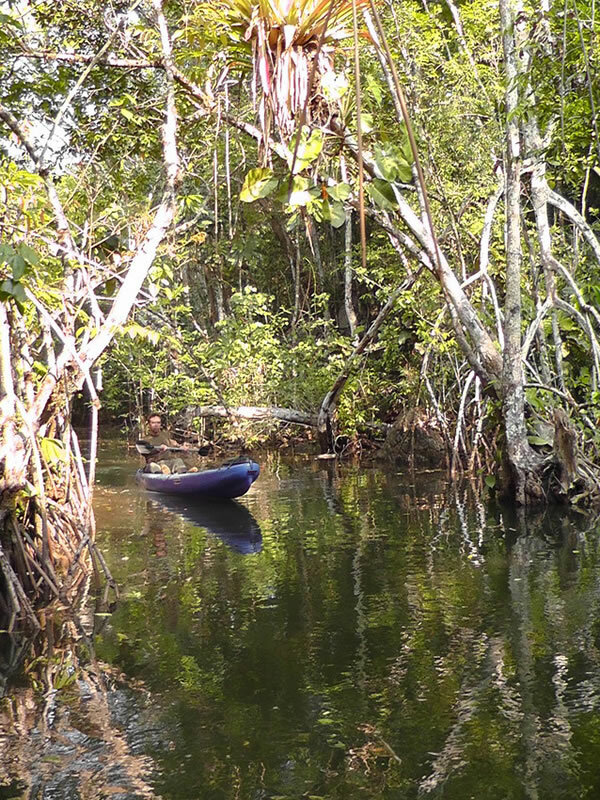 In April 2011, Ruth Canning from the World Land Trust (WLT) went to Guatemala on a site visit to the Laguna Grande-Sarstún Reserve, funded by WLT. This provided an excellent opportunity for Ruth and colleagues at our partner organisation FUNDAECO (Fundación Para el Ecodesarrollo y la Conservacion) to share skills and knowledge, further strengthening our collaboration. Ruth is WLT’s Conservation Programmes Officer for the Americas, helping to support all 16 of our partner organisations across Central and South America. She helps co-ordinate funding priorities and maintains dialogue with partners from our Suffolk-based office. Despite its importance to the wealth of wildlife that live here, it is considered to be the single most threatened habitat in the Caribbean Guatemala region. It is being systematically logged and cleared for cattle ranching and agriculture, with less than 20 per cent of the original forest remaining. The Laguna Grande-Sarstún Reserve will therefore provide a safe haven for this wildlife. WLT are working to expand the network of reserves in this area and are supporting FUNDAECO through the Buy an Acre appeal. This means that for as little as £25, you can help purchase and protect this threatened habitat and its wildlife forever. The fish farm started as a pilot project a year ago and was seen as a learning experience. The group now plans to work on marketing and expanding their work; firstly buying a fridge-freezer to store the fish and then to publicise their work on the radio. At the meeting FUNDAECO pledged more funding so the group could start on some proposals. Ruth also had the chance to meet the new ranger at the Laguna Grande-Sarstún Reserve, Ricardo Caal, who is being funded by WLT’s Keepers of the Wild appeal. 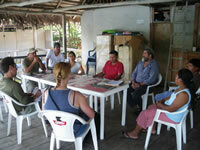 Ricardo is from a local village and has been hired to manage and protect the reserve. 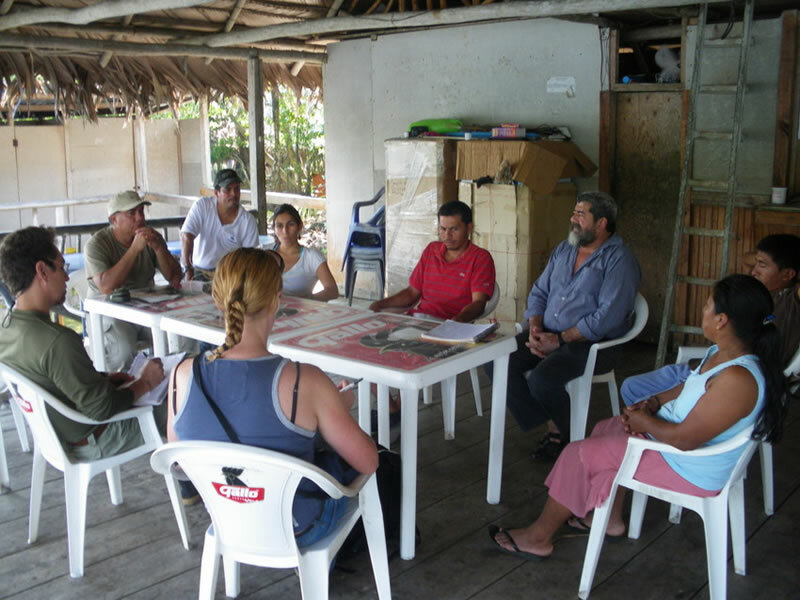 Ricardo is very experienced in working with local communities, which will be invaluable to FUNDAECO as they continue to strengthen their relationship with local people. Ruth saw the work that Ricardo and the other rangers had recently completed, creating a board walk from the water’s edge into the forest. They aim to link trails within Laguna Grande-Sarstún Reserve with trails in the Sarstún Multiple Use Area, making it easier for visitors to enjoy the reserve in a manner sympathetic to the environment. 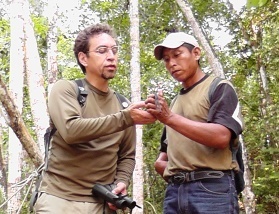 Along with the other rangers funded by the Keepers of the Wild appeal, Ricardo posts regular updates on our website about his work saving some of the most threatened habitats and wildlife in the world.